Frequently Asked Questions related to accessing and using the Goldrush Getaways website. Please take a look at this tutorial to help you reset a lost or forgotten password: View Tutorial. Please take a look at this tutorial to help you change your account password on goldrushgetaways.com: View Tutorial. All Goldrush Members have been given a username when their online account was created. I keep getting an 'Invalid Token' error and can't log in. Rest easy, this error is not related to your username or account. This error is caused by certain circumstances that can easily be corrected. If you still encounter this error, please do not hesitate to contact us. I am having trouble accessing the website. What should I do? If you have any 'pop-up blocker' tools installed, you will need to set them to allow content from goldrushgetaways.com in order to access this site properly. Why can't I register for a class? All classes have a maximum number of attendees allowed. Once this limit has been reached, the "Register" button will no longer appear on the Event Details page. Why did I see a page about 'SiteLock' when I went to goldrushgetaways.com? We have recently subscribed with a provider 'SiteLock' to offer website protection that finds and automatically fixes threats, prevents future attacks, and accelerates website speed. 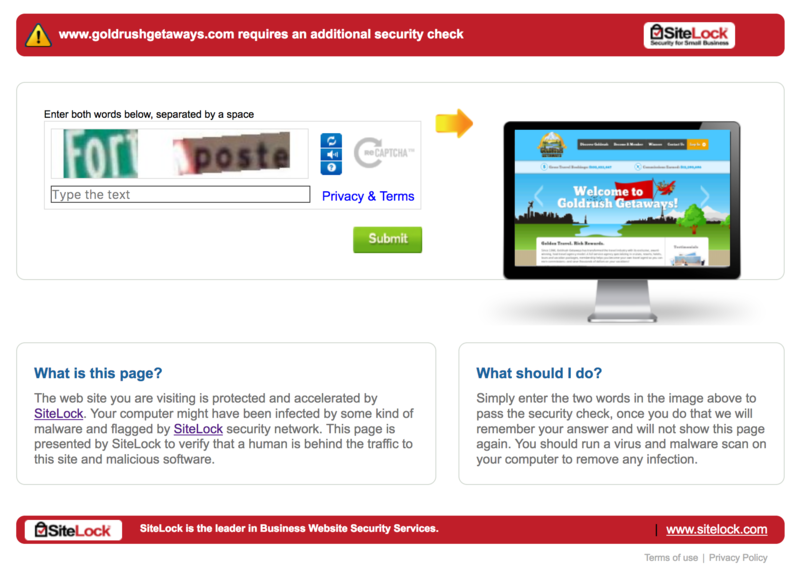 From time to time, you may see the following page requesting that you enter the words shown in the images. If you encounter this page, please follow the simple online instructions in order to access to our website.